"I hope you can join me this Memorial weekend in honoring those who gave their lives to defend our freedom by attending services at our local cemeteries. There will be services at Bakersfield National Cemetery, along with Union Cemetery, Hillcrest Memorial Park and Greenlawn Southwest. Please take some time this weekend to remember that freedom is not free. Bakersfield.TownHall@mail.house.gov. Hope to see you there. together discuss how our commonsense conservative principles can be applied. The end result will be real legislative initiatives as a part of a larger governing agenda. While politicians have traditionally been behind when it comes to technology, a major part of this project is www.AmericaSpeakingOut.com, which combines the technologies of Facebook and Twitter, to create a unique online forum that allows for an interactive experience. This is not about pushing an agenda from Washington; it is an open and transparent place where Americans can truly debate the issues facing our country. I hope you will join the discussion about ways we can solve our country’s challenges. degree in International Relations. Joining her is Derek Wales who graduated from Garces and just finished at West Point with an electrical engineering degree. Another Garces graduate joining them is Vincent Phillips, who is a junior at the University of Idaho and working on an agricultural engineering degree. As a former intern to Congressman Bill Thomas (who, by the way, rejected me at first), I believe the internship experience is a great way to learn about our community and the public policy process. would save taxpayers $30 billion over the next 10 years. Even though 18 Democrats joined Republicans in voting for this proposal, it failed because the Democratic majority did not want to freeze their own pay. To vote next time: http://republicanwhip.house.gov/YouCut. This is Latte, the cat of the previous owner of my new home. I am cat sitting until they move into their new home. Here's Latte and her morning routine. 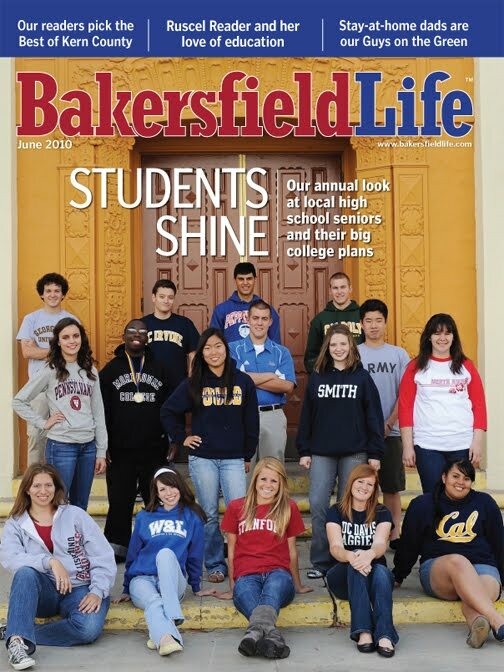 More of our kids head off to top colleges and is Oxy getting ready hire dozens more for Bakersfield? * ... LAY'S MODEL: It's not often you open the New York Times and see a familiar face staring at you from one of the photos. But there he was, local farmer Brian Kirschenmann, beaming from a potato field in a photo accompanying a story on Lay's new marketing strategy. If you remember, Brian was chosen as one of the Lay's models because he exudes a "simple, salt of the earth" appeal. Expect to see more of Brian's smiling face as Lay's pumps up its marketing campaign. * ... ANN ARBOR BOUND: Liberty High senior Paul Brumfield has opted to spend the next four year in Ann Arbor instead of Eugene. The son of Superior Court Judge Lorna Brumfield and local attorney Bob Brumfield, Paul initially had decided to attend the University of Oregon on an academic scholarship. But that was before he learned he was accepted into Michigan's Vocal Performance major. Only 30 kids out of 300 who auditioned made the cut. Proud father Bob told me that his sister lives in Ann Arbor and in addition to that, he gets to spent more time at Zingerman's, the college town's famous delicatessen. 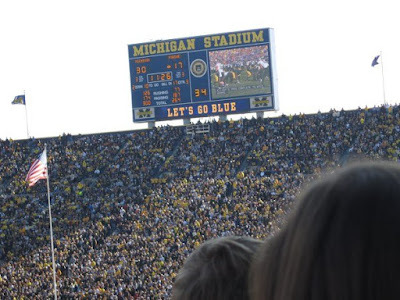 Paul joins a family of some 40,000 rabidly loyal Michigan students, including my own daughter Hannah, who will be a junior next fall. *... COMING HOME: Dr. Bill Farr dropped me a note to tell me about a West High graduate who will be coming home to join the Farr Medical Group in August. He said Alycia Garcia Campos, who graduated from the Medical College of Wisconsin, will be practicing family medicine at his practice. 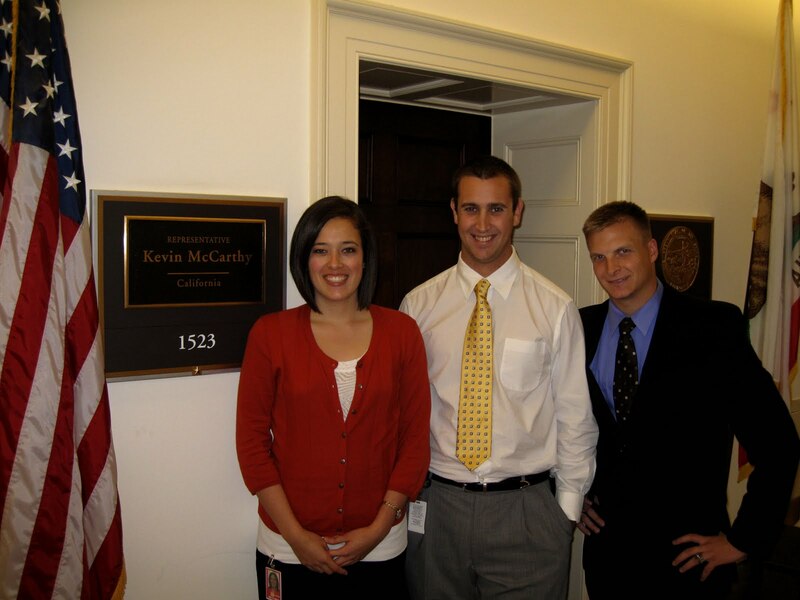 She is currently the chief resident of family medicine at Northridge Hospital. * ... STAR STUDENT: Another reader, Joy Tolladay, wanted me to know about Allie Trakimas, an outstanding senior over at Frontier High School. She will be attending the University of Pennsylvania but was also accepted at Johns Hopkins, the University of Portland, UCLA, UC Davis, UC Berkeley, UC San Diego and the University of Rochester. Not surprising, Allie was at the top of her class. But according to Joy, apparently Frontier has elected not to recognize a valedictorian this year (which she would be) despite a petition from a couple hundred students. Either way, she has accomplished a lot and that will have to be recognition enough. Allie's parents are Lucy and John Trakimas. * ... CARROT TOWN: Reader Donna Greer wrote in response to an earlier post about Bolthouse carrots being found in London. "I've purchased their carrots in Illinois, Texas, Matamoros, Mexico, Argentina, Venezuela and the West Indies. I chuckle every time I see our carrots so far away from home!" * ... OVERHEARD: Lots of speculation on the streets that Occidental Petroleum will soon be hiring dozens of new workers for Kern County. There's no official word on it yet, but we do know about Oxy's big new oil strike somewhere in Kern County. The oil could be worth as much as $34 billion based on today's prices. The arrival of dozens of new managers and workers could be a big boost to our local housing market at just the right time. 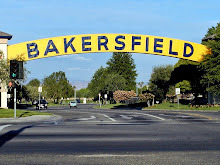 * ... EAST BAKERSFIELDISM: This from reader John Pryor: "You must be an East Bakersfield old timer if you shopped at the ADS Market on Baker Street across from the library. ADS stood for the name of the store's owner: Admiral Dewey Sprayberry. We called him Dewey." 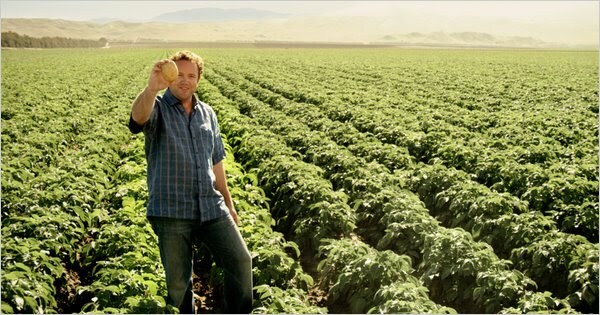 Bakersfield potato farmer Brian Kirschenmann is one of the primary "real farmer" models that Lay's is using in a new advertising campaign. Today's New York Times (real the full story here) reports that Kirschenmann, head of Kirschenmann Farms, was chosen to reflect the company as "genuine, simple, plain-spoken and salt of the earth. You have to love the folks over at the El Camino Mexican restaurant on Truxtun Extension. Playing off the overplayed hand of Big Labor's policy of putting "Shame on you" banners in front of businesses that use non-union labor, El Camino chose to use it as a way to promote happy hour. 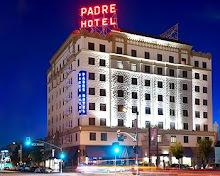 Below, El Camino's sign followed by a real "shame on" banner in front of the Padre Hotel. * ... GOOD NEWS: If there is a winner in this terrible oil disaster in the Gulf of Mexico, it may be Occidental Petroleum. At least that's the view of Bloomberg news service, which said Oxy is "leading a rush to find crude on land" as the disaster spurs tougher offshore drilling rules. Oxy recently doubled its estimate for a discovery near Bakersfield, to the equivalent of as much as $34 billion at current prices. Bloomberg said Oxy "bucked the oil industry migration to deep-sea drilling during the past decade and focused on onshore fields from California to Texas to Abu Dhabi." The story went on to say that Oxy is keeping the precise location of its Kern County discovery a secret to prevent competitors from trying to buy adjacent tracks of land. * ... COLLEGE BOUND: The city magazine BakersfieldLife comes out Saturday with its annual spotlight on some of our community's high achieving, college-bound kids. This is my favorite issue as it focuses on some of our local success stories, all of them inspirational. Among those being profiled are Joanne Bae, Liberty, headed to UC San Diego; Wesley Elrich, BHS, headed to UCLA; Kristyn Pendley, Ridgeview, headed to UC Davis; Tyler Davisson, West High, going to Cal Poly; Alexandra Tamplin, South High, bound for Stanford; Brandon West, Garces Memorial, Pepperdine; Katherine Scott, East High, headed for Smith College; Andrew Morales, Highland High, UC Irvine; Jake and Lauren Howry, Centential, going to University of Chicago and Washington and Lee, respectively; Melissa Hamilton, Stockdale, bound for Stanford; Michael Moore, Golden Valley, Morehouse College; Nathaly Navarrette, North High, UC Merced; Alex Kim, Stockdale, West Point; Jasmin Barrena, Foothill High, UC Berkeley, Brice Ezell, Bakersfield Christian, George Fox University; and Alexandria Trakimas, Frontier High, University of Pennsylvania. * ... GARCES POOL: Nice to hear that Garces Memorial High School is getting ready to break ground on a new state-of-the-art competition swimming pool . It will have 12 practice lanes and 10 competition lanes and a diving area with a depth of 14 feet. It will also have two one-meter diving boards and one three-meter board. It is supposed to be completed in December. * .,.. DRILLER NATION: Sue and Roger Allred wrote to tell me about their ninth child who will be graduating from Bakersfield High School on June 3. Their oldest graduated from BHS in 1993, the 100th graduating class of the school. "Our children have five bachelors degrees, one masters in education, one is a lawyer, one is going for a masters in physics, four are stay at home moms, and three are still working on degrees. We have had a wonderful time at BHS and thank those who have enriched our children's lives." And apparently all nine kids will be home for the graduation, coming from places like New York City, Brooklet, Ga., Salt Lake City, Ut., Tucson, Az., San Diego and of course Bakersfield. * ... AMGEN TOUR: A reader asked me to list the three committee chairmen who worked so hard to make last week's Amgen Tour of California a success, so here they are: Sam Ames of Action Sports was responsible for the VIP area, Janey Clary was in charge of the hundreds of volunteers and Doug Gosling, an attorney with Klein, DeNatale, was chairman of the festival committee, where all the food and vendors were set up. * ... EAST BAKERSFIELD: You know you're an East Bakersfield old timer if "you remember what the original price of a hamburger at Ken-Ken's was. 10 cents." 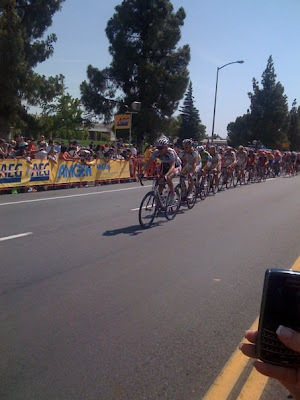 * ...ONE FINE DAY: Our city was at its best last week when Stage 5 of the Tour of California bike race ended with an impressive sprint in front of Bakersfield College. Beautiful day, great crowd, hundreds of volunteers and a thousands cheering a terrific sports spectacle. The scene reminded me of the old Bakersfield Business Conference events out at Cal State where folks saw old friends, enjoyed the food and made new connections. 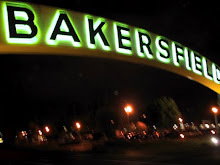 It certainly has the potential to become one of those iconic Bakersfield events like the business conference, the Cal State Jazz Festival and barbeque or even the Thanksgiving Day pie run at Hart Park. Hats off to so many volunteers who made it happen. Sam Ames over at Action Sports was in charge of the Local Organizing Committee hospitality tent, a huge hit, and store owner Kerry Ryan worked tirelessly with tour officials to get the stage to end up on the Panorama Bluffs. Local lawyer Jay Rosenlieb and Don Cohen, head of the Convention and Visitors Bureau, worked for months as did Earl Norcross of the Kern Wheelmen bike club. Those are just a few of the hundreds who made this happen. Let's hope we get it back next year. 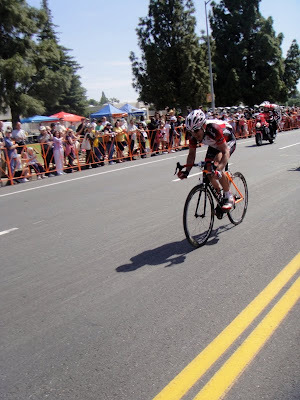 * ... OVERHEARD: The wife of a prominent local businessman, without credentials to enter the VIP tent at the bike race but who managed to talk her way into it anyway, was heard complaining loudly and angrily that she couldn't get a good view of the race because other folks were standing in front of her. Never mind that everyone else in the tent was there because they were either volunteers or had written substantial checks to help sponsor the bike race. She threw a fit anyway. Bad form. * ... ONE COMES HOME: Reader Maripat Ermigarat wrote to tell me about Curtis Cornelson, another in a long line of successful local kids who have returned to Bakersfield. Curtis played football at Centennial High School, went to Bakersfield College for two years and transferred to Colorado State on a football scholarship, graduating last year. He returned to Bakersfield and is pursuing his Master's Degree in History to teach at the high school level. "What's cool about this kid is that he is now the JV football coach at Centennial High School, working with his former coach, Bryan Nixon. I think it's pretty neat! Football just started at all the high schools once again, so he's back on familiar turf, being very comfortable back at CHS. His parents are Chad and Joan Cornelson and Curtis is still with his high school girlfriend of 7 years, Emily Ermigarat. I am Emily's Mom." Thanks for sharing. * ... DRAKE GRAD: Nice to hear from the parents of Frances Lopez, a Garces High graduate who went on to Drake University in Des Moines, Iowa, to study pharmacy. (Frances was a pal of my daughter Lauren at Garces). Turns out she recently graduated with a Doctorate in Pharmacy and is returning to Bakersfield to start her professional career. Said her mother: "It's been a long traveled road for her ... the holiday visits, the summer returns, the cold snowy winters in Iowa, the school load, new and old friends, the late night calls to mom, the calls to daddy for money and many more." Nice to see the kids turning out so well. * ... BOLTHOUSE CARROTS: When you live in the heart of carrot country brands like Bolthouse and Grimmway are household names and reasons for local pride. Which is why I enjoyed the following email from reader Jackie Bushby: "Hi, I received an e-mail from a cousin who was visiting England. They bought a bag of carrots to snack on and they got a surprise. The carrots were from Bolthouse Farms in Bakersfield...!!!!! They visit here often and thought it odd that the carrots came from so far away. 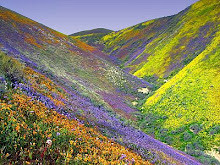 I enjoy your blog." Thanks for writing Jackie. 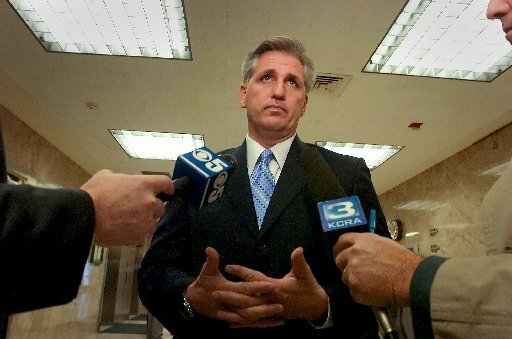 * ... EAST BAKERSFIELDISM: You know you're from East Bakersfield when "you remember McCarthy's yogurt and Kevin who served you there."